Konica Minolta Bizhub C364 Multi-function Printer Software and Drivers Download (Postscript-PCL) for Operating Systems Windows, Macintosh, Linux. Operating System(s): Mac OS 10.3.x, Mac OS 10.4.x, Mac OS 10.5.x, Mac OS 10.6.x, Mac OS 10.7.x, Mac OS 10.8.x. 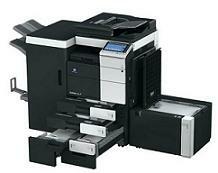 This page contains information about installing the latest Bizhub C364 Driver downloads using the Konica Minolta Bizhub C364 Printer Software.